In October, Wake Up Schools hosted a very special retreat for Educators at the European Institute of Applied Buddhism in Germany. Daniëlle Kole generously shares her experiences. 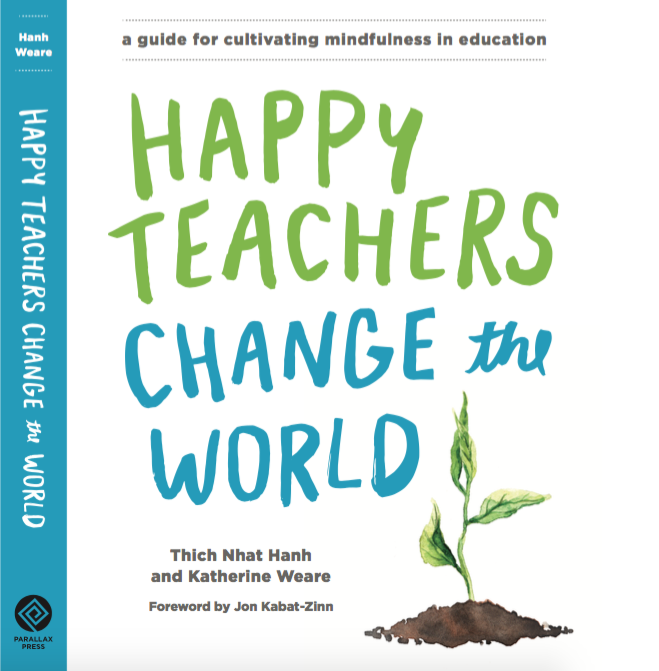 I have just finished the Happy Teachers Change the World retreat and want to share my experience with you. It was my first retreat and first stay at the EIAB. I had never thought of going to a retreat and had never heard of it before. A good friend of mine told me one day that she heard that a monk was giving a wonderful Dharma talk and that he would be present at a special retreat for teachers. I was interested and wanted to know more. What is it all about and what will they presenting to us? The retreat was given in English and was run by seven amazing people. The lectures were given by Brother Phap Dung and Brother Phap Luu. These past eight days were very intense. I learned a lot. The monks and nuns have given me so much knowledge, happiness and love. This retreat has helped me relax and find emptiness in my mind, joy in my heart and peace in my body. The monks and nuns at EIAB made sure we had a nice place to stay and amazing vegan food. They really opened up their house to us. Every morning you could choose from; porridge with seeds and nuts, bread, some jam or peanut butter and fruits. Lunch and dinner where always slightly different. Rice and veggies where the same but the way they prepared the tofu was different and delicious. I got really interested and wanted to take a course so that I could learn how to make more vegan food at home. I arrived on October 15th in the afternoon. I took a look around, got a room and prepared for dinner. When dinner, breakfast or lunch is served, you have to stand in line to serve your own food and eat in silence. This was something new and foreign to me. It was different when you are not allowed to talk while waiting for food or make conversation at the dinner table. Little did I know that my practice has started. Eating mindfully, I looked around and saw people chewing slowly, really enjoying their food and with every bite they took set their spoon or fork down. So I took small bites, and really tasted my food, felt the texture and appreciated the taste, smell and texture. After dinner we all did our own dishes and had small talk about the retreat. 6.05am a chapter from the book “a love letter to mother earth” will be read to the group. Waking up so early was at first hard for me but after the sitting meditation and exercise you feel relaxed and refreshed. After two days I got used to the schedule and woke up before my alarm would go off. Even now at home I would still wake up very early. I created a new habit. The sitting meditation was guided or in complete silence. We got the chance to practice breathing in and breathing out without our minds wandering off. Of course the first few days I could just concentrate on one breath and found myself wandering off. It was a challenge to keep coming back to concentrating on breathing and not to feel guilty about being lost in thought. It is going to take some practice and I hope by practicing daily I will be able to concentrate on more breaths. In the guided sitting meditations, we had to practice on looking inside our bodies. We had different people guiding us, telling us in simple steps how to scan our body and in some cases how to smile towards our body. In the guided deep relaxations we were lucky enough to have one of the seven amazing people play guitar. He sang and played some easy but beautiful songs that made us relax even more. The practice was very helpful for me. I could feel an amazing change day by the day. The meditations, sitting, deep relaxations and the mindful walking were important to empty our minds, get ourselves back in contact with our body and with our surroundings. The practice was very helpful for me. I could feel an amazing change day by the day. You could feel the energy of the group getting better day by day and see people smiling more often. What made this retreat different from the other retreats is the fact that the lectures where given with information that teachers can use in their classroom, which was an eye opener for me. It was knowledge which I could use at work but also at home. In total we had six lectures. In the first lecture Brother Phap Luu talked about the way we live. We need to stop more and enjoy life. We have to enjoy the now. We rush to go to work, do some shopping or to eat. We barely take a moment to breathe and to enjoy breathing. Our emotions control most of our lives; they give them color. If we nourish them they become more powerful. It is because of this that we have to learn to stop and breathe, let the emotions sink to the bottom so we can see and think clearly. Brother Phap Luu used a good example: “If you shake a glass of mud, you can’t see through it. But if you give it a few minutes, let it sink, you will be able to see thru it. So when emotions take over, breathe and take a few minutes. Allow the mud to settle down, allow the meditation of stopping”. As a teacher I find myself often controlled by my feelings and take action and don’t always make smart decisions. If I just took a moment and let everything sink in, I could think clearly and see all of my options. I could therefore make better decisions for me and my students. Brother Phap Dung spoke in the second lecture about recognizing our body. “When you become more aware of your body you will recognize your body. It all starts with your breath”. Your body reflects what’s in your mind. I can see that in my students. When they have a restless mind they tend to move a lot in the classroom. When a student is sad their body shows that. It is important to teach young people to accept their bodies. It is important to teach young people to accept their bodies. The third lecture was about feelings. Brother Phap Luu talked about five points in mindfulness of feelings: 1. Recognize, 2. Accept, 3. Embrace, 4. Look deeply, 5. Insight. When we notice a pleasant or unpleasant emotion, we first have to recognize it. After recognition we can accept it and try to understand its roots. As a teacher I can see a lot of students enter my classroom with a lot of anger. Sometimes we feel their anger and react to it, but sometimes I ask them why they are angry. I try to calm them down so I can recognize their emotion, instead of fueling their anger. I try to get my students to look into their mind and discover their emotions. When we have a strong emotion we should recognize it for what it actually is, then accept it and then embrace it. Like Brother Phap Luu said “we give our emotion a bath of mindfulness”. The next lecture was about the qualities we as a teacher should remember. Mountain (solidity and stability) – every teacher needs to create a mountain inside themselves to create solidity and stability. As a teacher we need to have the quality of a mountain. Flower (freshness) – we as teachers need to take care of ourselves. Do things like reading a book or take a walk in the park that makes you happy. When you don’t have time to do the things you love the most you have to be careful because the things we love to do help us to be in the present moment. So check yourself from time to time and see if you still have time in your hectic life as a teacher to do things you love the most. Still lake (clarity) – it is important to empty the mind. With an empty mind we can see more clearly. Give yourself (especially as a teacher) some time (a moment during the day, between some classes) to empty the mind and relax. You can walk mindfully from class to class. Space (freedom) Don’t lose your freedom. These four qualities are very important to me; they are qualities I have to develop. I want to keep my mind fresh and clear. It will heal my body and mind better and faster. In the next lecture Brother Phap Dung gave a nice example “See your classroom as your garden. Let the flowers bloom more every day, don’t take away the weeds but transform them in beautiful flowers”. Make sure you let the students that do their best bloom more and the students that are angry or tend to bother your class, change and understand themselves. When Brother Phap Dung said this some of us spoke about it. We tend to put our energy on the students who are angry and forget the ones whom work hard. If we shine our light more on them, they will bloom even more. Instead of punishing the ones that tend to disturb our classes, we must teach them how to change and how to look inside themselves. On the last day we had a very interesting lecture about karma. A lot of people use the word karma when they are angry at someone because of their actions. Karma means action, action in body, speech and mind. Brother Phap Dung spoke about creating our own karma. It is in our own hands. We can guide it. Brother Phap Dung used a nice explanation: “look at a burning candle. It produces karma (light). The karma affects the rest of the candle (the warmth of the light) and makes the candle change”. Create the karma you want to have. Don’t let your emotions make choices for you. In the beginning I was a bit skeptical about this retreat because it wasn’t being lead by Thich Nhat Hanh but throughout this retreat I realized that he taught his students very well. It felt as if he himself was there giving the seminar. I am filled with joy and happiness for having the opportunity to have gone through this experience. I am home! Wake Up Schools will be hosting another educators retreat at the EIAB, Germany from April 8th until April 13th, please click here for more details and registration. For information on more educators retreats and other events please visit our events page.